Jousting Windmills - shapes inspired by the heraldry of the school crest and a holiday sailing on the Norfolk Broads. Every year since 2009, I have run a two day workshop with year seven pupils at The Latymer Grammar School in Edmonton. Two groups of thirty pupils take part, working on consecutive days constructing a sculpture (or sculptures)to then be shown in the central courtyard until the following year when it is replaced by a new one. 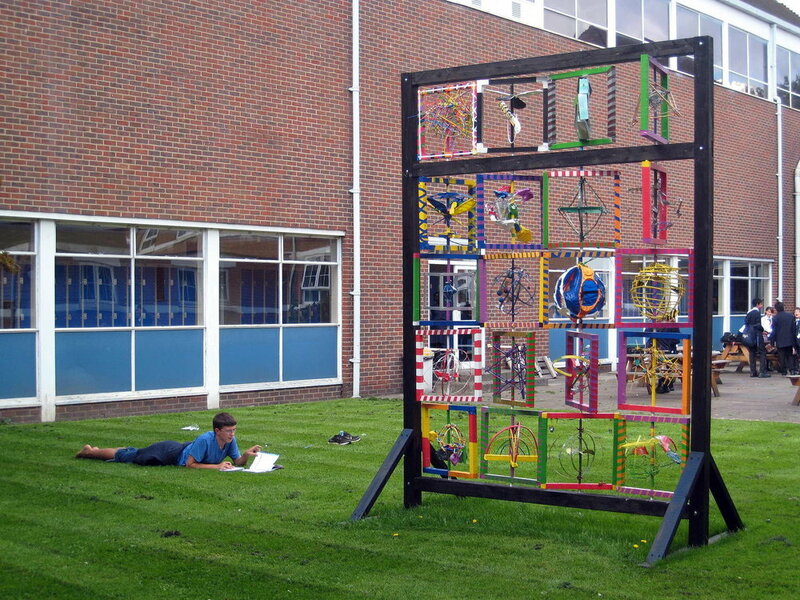 Abacus - 2010 - Marking the schools Centenary. Olympic rings from foam pipe and tape. Lots of cable ties, bamboo and some old windsurfer masts. Sawing, drilling, nailing screwing, weaving, carving, gilding. Lots of sawing, hammering, drilling and screw driving. Cutting, measuring, drilling and riveting. Bending and modelling metal, mixing and applying plaster and scrim. Sawing and nailing wood. Getting stuck in with plaster work. Sawing, sanding, drilling, nailing, screw driving. Next year will be my tenth in a row.